Frugal Tractor Mom: I Want a Nutrimill Grain Mill! 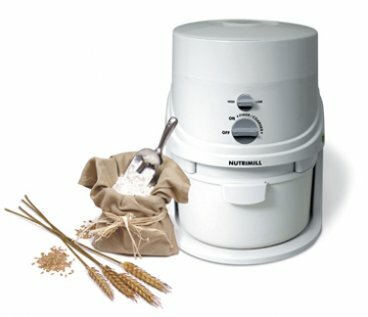 I want a Nutrimill Grain Mill! I want to mill my own flour! So I found this giveaway from a friend on Facebook. The thing that makes this machine so amazing to me is that you can take 4 cups of wheat berries and it will make it into 8 cups of flour without getting your whole kitchen or house dusty. I love to use fresh ground flour and corn meal. We have friends that have grist mills and they are VERY messy. You also need to constantly monitor how the mill is grinding. The thing that makes mills like these hard to use is that you have to hook them to some type of power source: i.e. a tractor or water wheel. With a Nutrimill Grain Mill, all you have to do is put in your grain and plug it in! You don't have to do a large batch at a time. You can do only what you need to cook with at that time! Fresh milled flour is so much healthier for your family! And the cost is much less! Most wheat berries are less than a dollar a pound while 1 cup of berries can produce around 2 cups of flour. That is a huge cost savings. The Nutrimill Grain Mill is a steep investment. So I am writing this post to help me try to win one!! Please visit Heavenly Domestic and check out her awesome review! Also check out Kitchen Specialties and Granary who is sponoring this giveaway. They have some more wonderful products that I wish I could review myself!! And they have a really neat story on how they got started selling bakery supplies. Now does it really make a huge difference in taste when you mill it yourself? I've never heard of such a thing! I have one and I love it. The only thing is that it is pretty loud but I don't think that is something that you can ever get around with a mill :) It works really well and grinds the wheat to a fabulously fine flour.